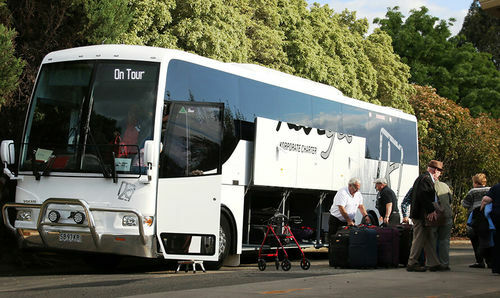 The Bell Tower is able to accommodate two full coaches easily on a twin share basis with room for single supplements. Our welcoming and experienced staff take care with all travellers including the elderly. We make sure that dietary requirements are met by our chefs and meals, including breakfast, can be scheduled to time requirements. We allocate rooms close to services for visitors with restricted mobility and all our rooms are ground floor with tea and coffee making facilities and walk in showers. Coach parking is free and on site, with an area for coach washing, water restrictions permitting. The Bell Tower welcomes group bookings for schools, sporting groups, car clubs, seniors groups or other private leisure groups. Our groups services include Dinner, Bed & Breakfast packages, short term, long term or overnight stays. The Bell Tower is close to the Miner Dome, the Aquatic Centre, Ballarat Golf Club, Southern Indoor Tennis Centre, walking tracks, Ballarat Private Schools, mini golf, football clubs and ovals. Family Rooms, picnic... bring your bike! A 5 min ride to the bike track from the Belltower, enjoy it with your family for a great day out. Pack a picnic or ask us and we can provide one for you... all you need to do is bring your bike!